Indiana Pacers guard Victor Oladipo underwent successful surgery Monday to repair a ruptured quad tendon in his right knee, the team announced, but no timetable was given for his recovery. The Pacers lost the 26-year-old playmaker, whose father is from Sierra Leone and whose mother is from Nigeria, for the season after he suffered the injury with 4:05 remaining in the second quarter of last Wednesday’s 110-106 home victory over Toronto. 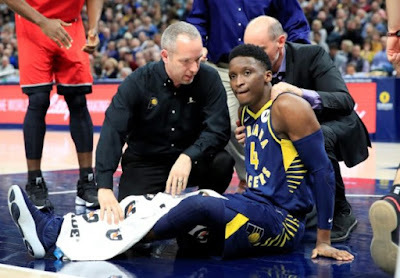 An update by the club said Oladipo was expected to make a full recovery but gave no indication what his recovery timetable might be. Oladipo was averaging 18.8 points, 5.6 rebounds, 5.2 assists and 1.7 steals for the Pacers this season. The Pacers rank third in the Eastern Conference at 32-16, three games behind pace-setter Milwaukee.